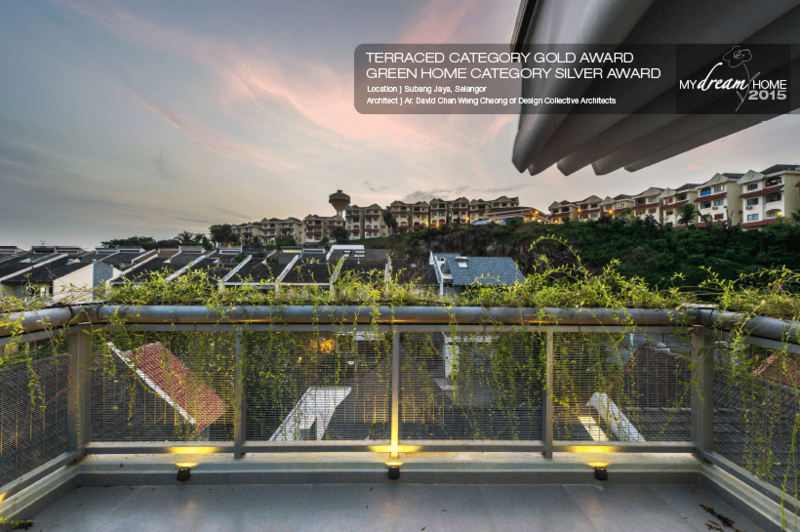 Dday Haus derives its name from Dylan and Dayton, the two young boys who call this terraced house in Subang Jaya home. 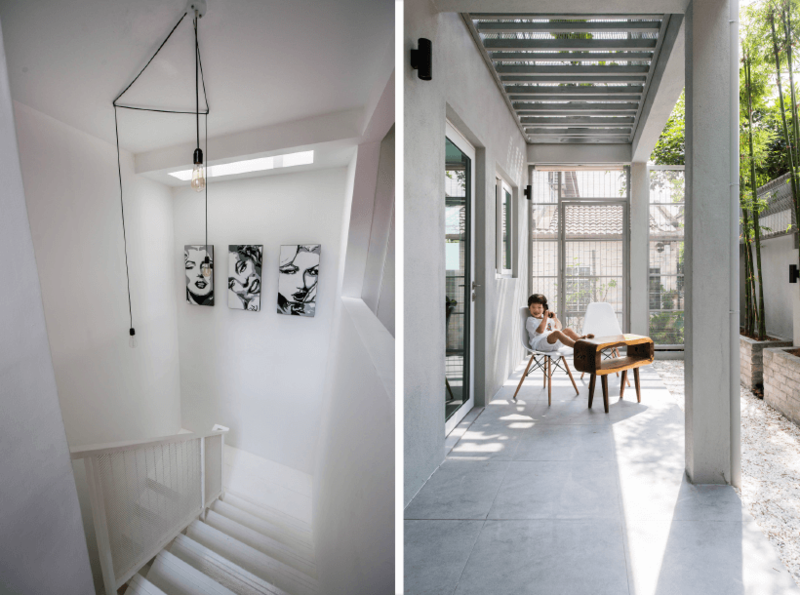 Their architect father, David Chan, is naturally the force behind this creative living space, while mother June Lim can be credited with ensuring the white interiors remain pristine, despite the presence of a four- and five-year-old. 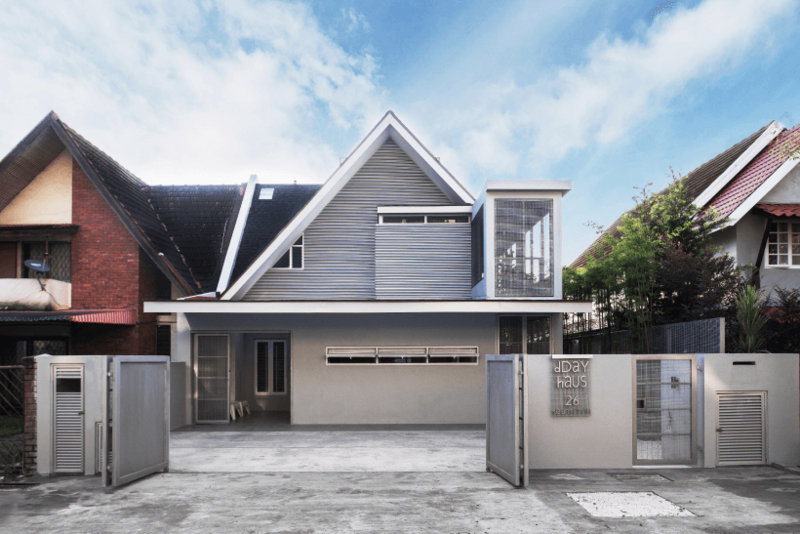 When they purchased the house in 2012, Chan and Lim decided to retain its original façade, in keeping with the neighbourhood’s theme, as well as most of its original structure. 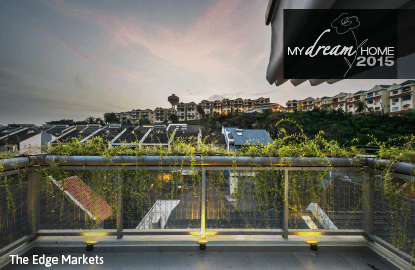 What they did noticeably do was install a rooftop deck with views over the city, looking all the way to Menara TM in Bangsar before the checkerboard of high-rises cuts off the panorama, and a two-storey mesh extension on the right side of the house. Fashioned from semi-open steel mesh, the extension is perhaps best described as a sort of cage, though the term undermines the elegance of the structure. It expands the interiors of the ground and first floors while remaining open yet enclosed — sunshine and a steady breeze flit through unhindered and the boys can play safely without security threats. Within the brick walls, white dominates the colour palette of the open layout, from the walls and ceilings to the treads and risers of the staircase. Tiles the colour of cement and an island countertop composed of Corian (also known as compact marble) contribute to the raw aesthetic, interrupted only by a massive dining table carved from a single piece of Papua New Guinea rain tree and a retro couch in the living area pointed towards a blank wall with a knee-high cement rendered ledge running its length. The absence of a television is conspicuous and intentional. “Guests are forced to make conversation,” jokes Chan, which was precisely the point. The typical street view is also missing here with the relevant wall blank, save for narrow windows cut high and the low ledge. Instead, the sliding doors leading to the mesh extension are always open, looking out to the side terrace. Brick window boxes were built along the garden wall and planted with supple bamboo, whose leafy heads wave in greeting at the first floor. Lim explains that the design was material-led in its use of materials evocative of elements present outdoors. “The cement bricks used to build the window boxes are echoed in the feature wall of the children’s playroom downstairs and in the television area upstairs,” she says. The bamboo trees outside are repeated in the dozen or so bamboo blinds that adorn the mesh extension on both levels, while the mesh itself — left in its natural shade of silver outside — is used again inside to create a banister for the stairs as well as a see-through panel in the floor upstairs, directly above the dining area. Indoors, the mesh is painted white, in keeping with the colour scheme. Up the staircase, one arrives at another lovely open layout. Walls are minimal; sliding doors are preferred to mark the bedrooms on either side while casement doors open out to the mesh balcony straight ahead. Sunlight positively floods the space, reinforced by a skylight Chan cleverly put in above the mesh floor strip, so that it even naturally lights the dining area below. Light-hued Tasmanian wood floorboards are in tandem with the soft palette and faint tracks of toy car wheels suggest hours of play up here. The boys’ bedroom on the right features another simple yet efficient green addition. The western wall, which bears the brunt of the sun’s heat during the day, was affixed with an external layer of aluminium cladding in the form of a ventilated louvred screen. The cavity in between the screen and the wall acts as a buffer for the heat, thus keeping the room cool on sunny afternoons. Across the hall is the master bedroom, though that isn’t immediately apparent. All one sees at first is a wall-to-wall wardrobe and stairs — held down by just two legs — leading up to the mezzanine sleeping area. The design is akin to a loft, with open space favoured over fussy furnishings. 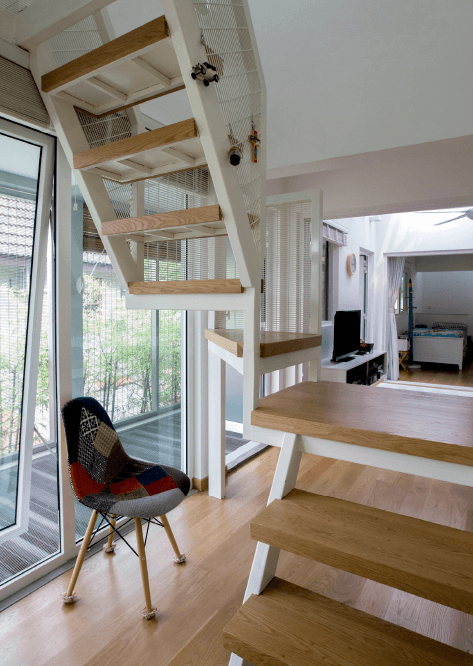 The intermediate landing of the flight of stairs is hip-high, perfect for folding clothes, while the clear space underneath is ideal for storage. Leading to the rooftop deck is the spiral staircase tucked away beside the kitchen, which can also be accessed from the drying yard behind the master bedroom on the first floor. “It’s superbly underutilised,” quips Chan, though Lim does work out in the space occasionally. Visitors of course delight in this feature, causing Lim to call it a show-off piece. Throughout the home, furnishings are minimal with creative little touches imagined by Lim; umbrellas hang from a leftover plumbing pipe affixed to the wall while a comb of bananas swings from a spare doorknob screwed into the kitchen wall as a hook. Something else catches the eye: all switches are four feet high, around elbow height for an adult, instead of being placed at the traditional height of five feet. Minimal walls and furnishings fulfil a dual purpose in their versatility: the couple often receive requests to have commercial shoots done in the house and the design was executed to accommodate possible future renovations. “We didn’t buy this place thinking of just our immediate needs,” says Lim. “In a few decades, we might want to rent out the house and move into a smaller apartment in our old age.” The cage that currently connects the two bedrooms and upstairs living area on the right side could serve as individual entrances for the bedrooms if a direct staircase leading up from the porch is later introduced, she illustrates, while the lack of walls allows the interiors to be easily manipulated. 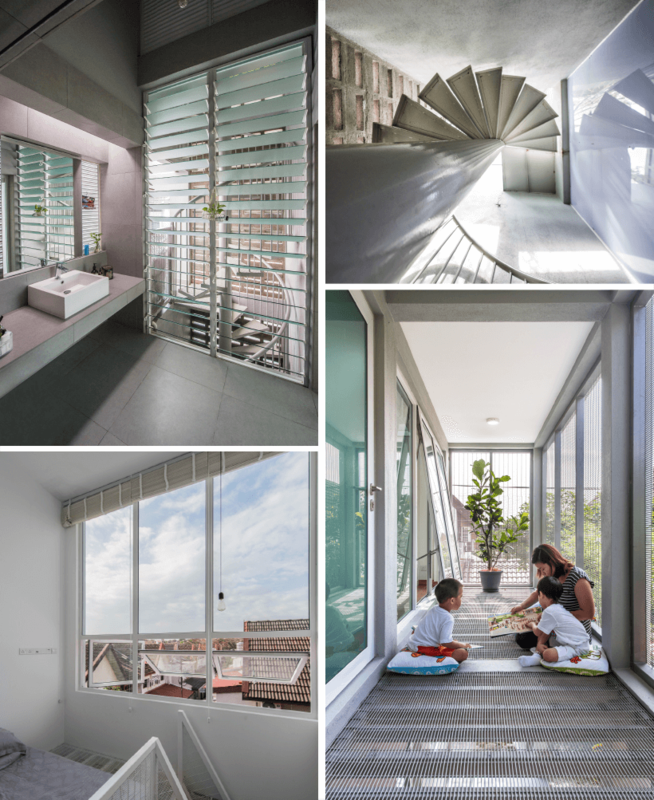 In the meantime, the interconnected layout, with spaces flowing seamlessly into each other and touches like the see-through mesh floor strip upstairs, ensure the family can easily keep in touch even when in different rooms. It’s an advantage right now given the young age of the children but beyond that, the design infuses a sense of reassurance and intimacy — the pillars of any great family home.